What Are House Fixtures in Real Estate? What Stays and What Goes With a Home? Question: What are house fixtures in real estate? A reader asks: "My husband and I bought a home in Land Park. A six-foot by three-foot rose garden lines the backyard fence. When we did our final home inspection, the roses were there. But when we showed up the following day with our moving truck, we discovered the roses had been dug up and removed. Our agent said the roses are a fixture. What types of things are considered house fixtures? Can the seller legally take the roses?" Answer: What are house fixtures and which things are not fixtures is the basis for many real estate disputes. Generally speaking, all landscaping, or any type of plant with roots firmly ensconced in the ground, is considered a fixture. A fixture is not required to exist inside the house. If the seller won't return the roses, perhaps you can ask the seller to reimburse you so you can buy your own? When I take a listing, I walk through the home with the seller to discuss fixtures. If personal property is affixed or fastened to real estate, it becomes a fixture. Fixtures become real property when they are attached to the property. If the seller has a certain affection for a fixture, I suggest the seller remove it and, if necessary, replace it. If a buyer never sees it, the buyer won't want it. Soon as you call attention to a fixture and tell the buyer she can't have it, she'll covet it. It's just human nature, quirky as that may sound. It might be the one thing that will cause the buyer to withdraw an offer if she can't have it. One seller had developed an attachment to his Bosch dishwasher. Now, one can't remove a dishwasher and leave an empty space between the cabinets because buyers would object. The seller bought a Kenmore and installed it before we put the home on the market. People become attached to the strangest things. When I bought my home, the seller, without my authorization nor knowledge, had removed the bedroom drapes the day of closing. I insisted she return the drapes because they were custom made for the curtain rods and for those windows. When she refused, I threatened to take her to Small Claim's Court. The following day, she was on my doorstep with the box of drapes, a bottle of wine, and an apology. Turned out the drapes would not fit the windows in her new home anyway, but she had deliberately taken them, even though she had no use for them. Why? Because they were expensive, she said. Every state has its own guidelines for what constitutes a fixture, but here are the five tests California courts use to determine what is a fixture and what is not. I use California standards since often that state leads the nation. Not every test needs to be met. Method of attachment. Is the item permanently affixed to the wall, ceiling, or flooring by using nails, glue, cement, pipes, or screws? Even if you can easily remove it, the method used to attach it might make it a fixture. For example, ceiling lights, although attached by wires, can be removed, but the lights are a house fixture. Adaptability. If the item becomes an integral part of the home, it cannot be removed. For example, a floating laminate floor is a fixture, even though it is snapped together. 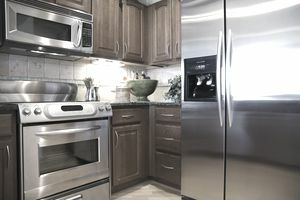 One could argue that a built-in Sub Zero refrigerator is considered a fixture, although it can be unplugged, because it fits inside a specified space. To remove could damage the area around it. Relationship of the parties. If the dispute is between tenant and landlord, the tenant is likely to win. If the dispute is between buyer and seller, the buyer is likely to prevail. Agreement between the parties. Read your purchase contract. Most contain a clause that expressly defines items included in the sale and ordinarily state." All existing fixtures and fittings that are attached to the property." Sellers and buyers should specifically state in the purchase offer which items will stay with the house and which will go, especially if there could be confusion over house fixtures. Items such as kitchen appliances, bookshelves, portable spas, water fountains, and washers and dryers, should be noted in the contract as included or excluded from sale. If included, lenders want to see verbiage the items are without warranty nor consideration. In California, many buyers are confused about koi ponds. Do the fish stay or go? The pond is a fixture, but the fish can be carried away in a bucket of water. Some koi are kept as pets. If a buyer wants to negotiate for the koi, buyers are advised to identify the type (some can cost $3,000 a piece), count the koi, and write the fish into the contract. For legal questions, please consult a real estate lawyer.